Were Jack the Ripper's Victims Sleeping? It is generally assumed that the victims of Jack the Ripper were murdered because they picked up a client in the course of their activities as prostitutes, took him to a secluded location; and, before they could do anything about it, the client overpowered them, rendered them unconscious and murdered them. That, more or less, has been the accepted order of the events leading up to each murder for over a century. However, suppose it didn’t actually happen like that? Suppose that, instead of picking up the fatal client, Martha Tabram, Mary Nichols, Annie Chapman, Elizabeth Stride, Catherine Eddowes and Mary Kelly were, in fact sleeping when they were approached by and murdered by Jack the Ripper. In fact, let me pose it as a question – were Jack the Ripper’s victims sleeping at the times of their murders? In this scenario it would be necessary to discount Elizabeth Stride and Mary Kelly as victims of the ripper, simply because their final moments don’t quite fit in with the theory. Elizabeth Stride, for example, was seen by Israel Schwartz, involved in a violent altercation with a man, just fifteen minutes before her body was discovered. It has also been pointed out that her injuries were inconsistent with the injuries endured by the other victims – i.e. she had only had her throat cut. This has been explained away by the fact that the ripper may well have been interrupted before he got to carry out the horrific mutilations on Elizabeth Stide that he inflicted upon the bodies of his other victims. However, there is a growing groundswell of opinion that she was, in fact, a victim of a different killer than Jack the Ripper. So, perhaps, she could be discounted. Which brings us to Mary Kelly. She was the only one of the victims who had her own room at 13 Miller’s Court, inside which her body was found on the morning of the 9th of November 1888. The fact she was murdered indoors has been used to explain why the mutilations she sustained were far, far worse than those inflicted on the bodies of the other victims. But, there is a consensus in some circles that the reason her mutilations were demonstrably different was that she was murdered by a killer other than Jack the Ripper. Now, there is a possibility, some would say a probability, that Mary Kelly was asleep when the ripper began his murderous assault on her, but not in the way the other victims may have been. She may well have fallen asleep with her murderer-to-be lying alongside her on the bed in Miller’s Court. Now, there is a great deal of debate as to whether or not Martha Tabram was a riper victim. I can only say that, at the time, the majority of the detectives working the case certainly felt that she was. My own belief is that she was, and that she was, in all likelihood, his first victim. So, if we count Martha as a victim, and even if we don’t, what is interesting about these remaining four victims is that, at the time of their deaths, they were to all intents and purposes, homeless. Mary Nichols had been turfed out of her lodging house in Thrawl Street; Annie Chapman had been sent packing from her lodging house in Dorset Street; and Catherine Eddowes had only recently returned to London, and just been released from Bishopsgate Police Station, and she didn’t have any money to pay for a bed in a common lodging house. We know that all four of them were roaming the streets hoping to raise the money for their beds, or dosses, by resorting to prostitution. Or, at least, that’s what we presume. After all, we don’t, in all honesty, know the sequence of events in the hours leading up to their murders. What we do know is they were all tired and looking to sleep. Which brings me to the locations of their murders. Martha Tabram’s body was found on a landing of George Yard Buildings, at a location where homeless people were known to sleep. Indeed, several of the residents returning home to the tenement block actually saw what they later learnt was her body lying on the landing, and yet they presumed that she was one of the homeless people that they so often saw sleeping on the landings of the building. Is it possible that she had gone to the landing to sleep and that Jack the Ripper had, in fact, gone to the landing in search of a victim? Mary Nichols, was found in a gateway in Buck’s Row. It was a dark thoroughfare, not traversed that much in the dead of night. Had she simply laid down to sleep in the gateway? Admittedly one of the problems here is that the policeman on the beat would probably have seen her and moved her on, but then this is just a theory. the Scene of Mary Nichols Murder In Buck’s Row. 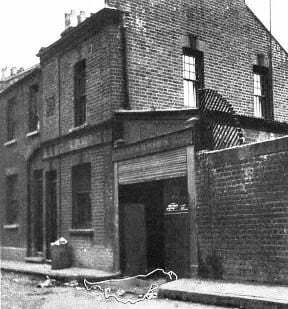 Which leads us to the backyard of number 29 Hanbury Street and the murder of Annie Chapman on the 8th September 1888. The street door to number 29 was left unlocked during the night, and we know from witness statements that the local homeless knew this to be the case and would often make use of the passage past the stairs, or the back yard to seek refuge in at night. Is it possible that Annie Chapman had simply gone into the backyard to try and sleep and Jack the Ripper had found her and murdered her? And, finally, we come to Catherine Eddowes, whose body was found in a dark corner of Mitre Square at 1.45 a.m. on the 30th of September 1888. Catherine had only recently returned to London, having spent time hop picking in Kent. On the evening of the 29th September she had been arrested for being drunk on nearby Aldgate High Street and had been taken into police custody. She was locked in a cell at nearby Bishopsgate Police Station, from which, having sobered up, she was released at around 1am. As far as we know she had no money, so she had no chance of getting a bed in a common lodging house. As a seasoned street walker, she would have known the locations where she might enjoy a few hours of undisturbed repose. Had she, therefore, decided that a dark corner of Mitre Square would make the perfect spot? Again, did Jack the Ripper then chance upon her prone, sleeping from and seize the opportunity to carry out another murder? Of course, there are numerous holes that can be picked in this theory – just as there are numerous holes that can be picked in any theory. I’ve already mentioned the fact that the policeman on his beat would have seen Mary Nichols, and would, doubtless have moved her on. Likewise, the City Police patrolled Mitre Square and the constable on the beat would, no doubt, have spotted Catherine Eddowes and seen her out of the square. Also, in the cases of Catherine Eddowes and Annie Chapman we have the added problem that they were seen by witnesses close to the crime scenes shortly before their murdered bodies were discovered, which would suggest they weren’t trying to sleep at the times of their murders. But, the point is, by pondering all the possibilities, and by thinking outside the box, we can view the case through fresh eyes and from a different perspective. The problem with ripperology is that too many uncertainties have, over the years, come to be accepted as certainties, simply because some self-proclaimed “expert” said it was so many decades ago and people find themselves unwilling to stick their heads above the parapet and go against the grain, for fear of being shouted down by the exponents of a particular theory or fact. And yet, it is only by thinking outside the box, and by putting forward different ideas – however outlandish they might at first appear – that we can hope to inch toward any solution on this intriguing and baffling whodunit. So, I’ll ask again – were Jack the Ripper’s victims sleeping at the times of their murders?